Our March 23rd meeting explored the techniques used in Human Performance Technology (HTP). 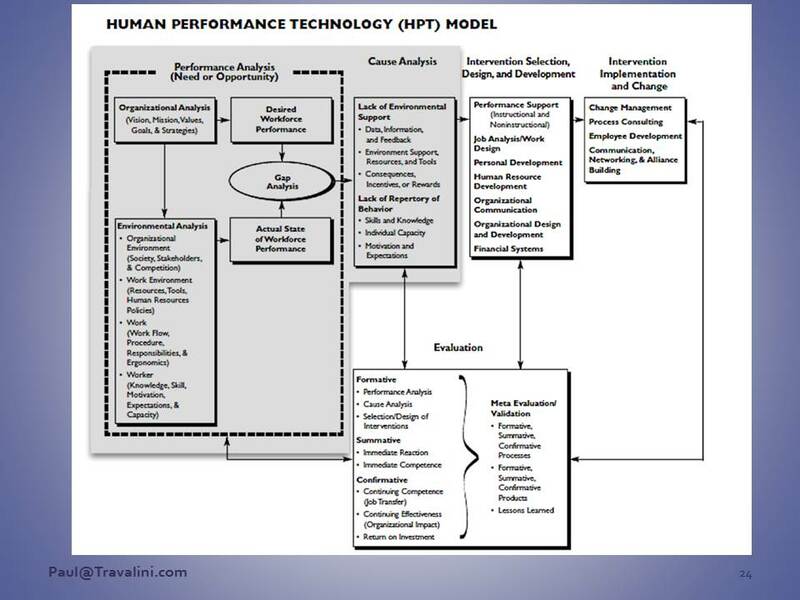 Paul Travalini shared insights for using this model. A group of educators, led by Benjamin Bloom, identified a hierarchy of six categories of cognitive skills: knowledge, comprehension, application, analysis, synthesis and evaluation. As students learn, they start with the knowledge level and progress through the hierarchy. Thus, advanced courses should include skills at a higher level than introductory or basic skills courses. Below you will find a web-resource as well as a list of measurable verbs to assist you in writing course objectives and assess learning outcomes. Knowledge Level: The successful student will recognize or recall learned information. Comprehension Level: The successful student will restate or interpret information in their own words. Application Level: The successful student will use or apply the learned information. Analysis Level: The successful student will examine the learned information critically. Synthesis Level: The successful student will create new models using the learned information. Evaluation Level: The successful student will assess or judge the value of learned information.